PLEASE NOTE CHANGES TO ALL NEW BOOKINGS - 7 (SEVEN) DAY BOOKINGS FROM SATURDAY TO SATURDAY ONLY AT A RATE OF $4,750 PER WEEK. Please check the calendar for availability and register your request for a quote or more information. LONG REEF BEACH HOUSE sits right on the water's edge in the quiet seaside town of Currarong. From the large deck, you can watch pelicans feeding in the shallows, spot dolphins exploring the bay, watch fishermen launching their boats and return with the catch of the day, or just relax and read the paper while watching the kids play and take in the breathtaking view. LONG REEF BEACH HOUSE is an easy 2.5 hour drive from Sydney, or 3 hours from Canberra, and around 30 mins from Nowra. It is well serviced by the local shops which include a small supermarket , restaurant/cafe, take away food, bottle shop and Bowling Club with a Chinese restaurant and free shuttle bus. For boating enthusiasts we have convenient direct access to the boat ramp. If bushwalks, windsurfing, snorkeling, kayaking or scuba diving doesn't tempt you, or if lying on the beach or swimming in the popular rock-pools isn't your thing, then we have fishing at your doorstep. A short drive away is beautiful Jervis Bay National Park with its world famous diving locations, dolphin and whale watch cruises, secluded beaches and charming coastal towns. LONG REEF BEACH HOUSE is a newly renovated, modern 4 bedroom, 3 bathroom house, sleeping 8 people comfortably, with all the conveniences of home, including flat screen TVs, brand new, fully equipped kitchen with new high quality fittings and appliances, remote control ceiling fans and living area blinds, luxury gas fireplace in the lounge, 2 gas BBQs on the front and rear entertaining decks, plus loads more. A securely fenced, grassed yard is a feature of this property, and is popular for those with pets and children. It is a lovingly cared for garden filled with ever changing delights including flowers, fruits, herbs and vegetables, all of which guests are welcome to. LONG REEF BEACH HOUSE is the perfect summer holiday break away with the ocean at your doorstep and large outdoor entertaining decks with BBQs... while also having all the comforts you need for a cosy winter escape, including a large new roaring gas fireplace and a fabulous gourmet kitchen for cooking up hearty family meals. LINEN including sheets, pillowcases, bath towels, hand towels, bathmats and tea towels are included in our price. All bookings are subject to our terms and conditions. On making a booking, we will forward you a confirmation letter outlining the terms and conditions applying to your booking. Confirming a booking indicates your acceptance of those terms and conditions. Queen bed sheets for 3 queen beds, king single sheets for 2 beds (king single with king trundle), along with bath towels, bathmats, tea towels, pillows, doonas and light blankets. A basic clean is included in our price at the end of your stay, and we appreciate guests taking care to leave the premises in a similar condition as at entry, removing all rubbish from inside the premises, and tidying all items used during your stay. Pets are permitted at Long Reef Beach House, subject to prior arrangement and payment of a refundable bond of $250. Conditions apply. Applied to all bookings at a minimum rate of $500 per booking. Availability can be checked in the calendar at the top of this page. Further enquiries and bookings can be made by following the directions in the on-line calendar. We will then contact you to advise the details. Confirmation of reservations will only be made upon receipt of a non-refundable 50% deposit. Payment of the balance is due 14 days prior to your booking. Payment can be made by credit card (Visa, MasterCard or Bankcard) or direct deposit. It was wonderful staying at Long Reef Beach House again. Great accommodation, with everything you could possibly need, including a bountiful garden; in a beautiful part of the world. We had a wonderful Family holiday at Long Reef Beach House, just recently. The location was great, short walk to the rock pool and beach. Also a short walk to the general store. Culburra was only a short drive, where we did our food shop at Woolworths. We enjoyed our recent stay at Long Reef Beach House with our extended family group. This is the second time we have stayed here and will hopefully return again. It is an extremely comfortable house for a large group who enjoy cooking and being close to the water. The only issue we had was that the outside furniture and windows had not been cleaned, when one is paying top price it is something we would expect to be done. Otherwise, tip top condition inside. We totally loved the house, location was ON THE BEACH with no one in front of us, and Pelicans less than 100m from the balcony. Currarong is a wonderfully sleepy town, perfect holiday destination for young kids. super safe bay to swim in. The house is beautiful tastefully designed, clean, open and with a magnificent kitchen. Nowra is about 25mins away and one big food shop was all we needed to lock ourselves away in this magical house for a perfectly relaxing holiday with family. We stayed at Long Reef for 7 nights. The property exceeded expectations on all levels. It has a beautiful and fully equipped kitchen with all you could want. Plenty of space and quality finishings including 2 en suites + main bathroom. The view is spectacular and the property has a lovely garden and verandah to relax in and take in the scenery. House had not been cleaned properly before our arrival, carpets not vacuumed, floors not swept, crumbs on benches and furniture. BBQs were absolutely disgusting and oven had crumbs and grime in it. Rang caretaker who came and cleaned BBQs and vacuumed lounge. Still needed lots of cleaning after she left. Disappointing start to holiday. 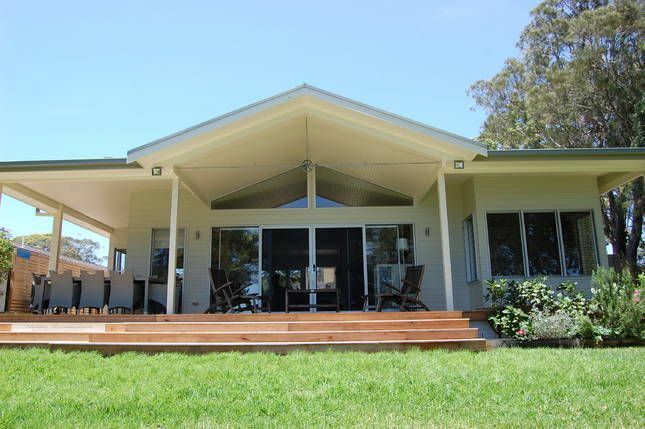 However the house is excellent for families and waterfront location is great, close to beaches and bush walks. Just wish the cleaners had done their job.